GB Fencing and Tree Surgery - Fencing/Gates, Garden Services, Landscaper , Tree Surgeon based in Rudgwick, West Sussex. Do you want a fence that's going to stand the test of time? 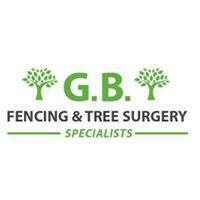 GB Fencing and Tree Surgery has many years of experience and strives to be the exemplar of quality British fencing. The fencing services provided are quick and efficient so as not to get in the way of your busy schedules. We are able to offer a variety of fencing options to suit all budgets and tastes. What's more, if you're not sure, we are able to advise you on the best choice for you. Don’t allow your trees to take over. Trees can really enhance the look and feel of your property but if they are not closely managed, they can become a real hazard that is hard to eradicate. Tree branches are very heavy and if one breaks off and falls on your house, you can imagine the damage it could cause. Also trees with sprawling roots can cause problems with driveways and even threaten the integrity of your house's foundations. Fortunately, if you get in touch with GB Fencing and Tree Surgery, this is something that you don't have to worry about. As experienced and professional tree surgeons, we will ensure that your trees remain safe. To see more reviews, pictures and information about our company please see our Facebook page.